Installs between the factory handlebar mounting clamp risers and the top triple clamp to reduce the reach to the grips. We have included a photo showing the HeliBar in the Touring Position on the left side, one of our engineering tools that allows us to accurately compare HeliBars to factory bars. This allows us to measure rear offset (distance closer to rider.) This straight edge is precisely aligned 90° to the front wheel and the fork is in the exact straight forward position. Notice the increased distance between the steering stem pivot and the end of the left damper weight. 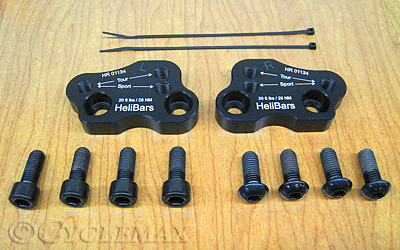 Heli Tour performance handlebar relocation adapters moves the factory bars into a more comfortable position by reducing reach. Increased leverage boosts confidence, improves low speed handling and makes the new Wing feel even lighter. Super precision adapters have drain holes in the recessed hardware mounting bores to eliminate corrosion from pooling water. Template included for trimming the plastic top handlebar mount cover. Video to reduce installation time: WATCH CAREFULLY! USE EXTREME CAUTION.